Does WordPress Understand the Future of Work? The Year Without Pants by Scott Berkun is fascinating. Berkun, a former Microsoft program manager, does an incredible job of documenting the strengths and weaknesses of WordPress.com’s culture and organizational model. He also describes his team’s creative journey as they build social media features for bloggers and the popular “Jetpack” extension. It's not a guide for how to how to implement a work from home program. Rather, it describes from an insider’s perspective how WordPress.com has managed to build one of the most popular and highly trafficked web properties by pushing control into the hands of those who make the product. It’s also a book about the concept of work itself, demonstrating how work can be something of deep meaning and value rather than a source of dread and frustration. I first learned about WordPress’s unique approach during a discussion with one of their engineering leads. He explained that they were organized into a set of teams, each focusing on a different area of the product. Each team is autonomous, deciding what to build and managing their own, planning, development and release. He explained that everyone on the team was required code and that there was typically no dedicated program or product management. (Berkun seems to have been an exception to that rule). He explained that there was also no traditional marketing department with each team sort of taking care of that on the side. Having worked for years in more traditional, functional organizations doing product management and marketing, I was intrigued. I continued to ask questions but he told me that I should just “read the book” which as you can guess turned out to be this book about working from home with no pants. If you are new to blogging or web content management, WordPress is the widely popular, open source software project started by Matt Mullenweg. It is free to use and the source code is available to use and extend under the GPL open source license. There are now over 73 million websites powered by WordPress. The book describes how Wordpress.com develops new products and services. The organization is intentionally left flat, eschewing titles, stripping out middle management and putting control in the hands of those who do the designing and coding. Berkun, borrows Eric Raymond's metaphor comparing the model to a “Bazaar” where there are many shops each running their own business, deciding what to sell and how much to charge. He contrasts that to a “Cathedral” model where architects plan and control every detail of an enormous project early in the process and well in advance of ever starting construction. As such, the company provides little direction to employees or to project teams, intentionally forcing members to think for themselves, discover answers on their own and manage their own efforts. Because Wordpress.com is a SaaS (cloud) solution each team is able to ship whenever their projects are completed rather than waiting for lengthy product release cycles. They can then immediately collect data about how new features are being used and fix problems in real-time. According to their website, engineers push updates 60-80 times a day using a “continuous deployment” approach. Berkun tells us that one of the reasons WordPress.com can be so flexible and dynamic is because there is no central marketing function. This allows developers to release new features when they are ready rather than being constrained by deadlines imposed by launch events or planned advertising campaigns. Project communication and collaboration is done primarily through a blog/online discussion forum called a P2, with real-time group chat on IRC and face-to-face meetings over Skype. The P2 is preferred over email because it creates a history of discussions and keeps debate open and visible for all to see. The company prides itself on evaluating employee success by the quality and quantity of the code they produce rather than how many hours they spend in their cubicles. There are many strengths to the WordPress.com model. It creates a more flexible and responsive development process because each team can move quickly, building and shipping based on customer needs rather that waiting for a lengthy and bureaucratic corporate decision-making process. Product decisions can also be data driven, based on a detailed understanding of how each feature is used on the site. The autonomous structure of the project teams creates an environment where employees feel empowered to focus on making great products that consumers actually use without being constrained by decisions forced upon them by managers who are not as deeply involved and invested in the project. The company has also benefited greatly from being able to recruit the best talent without being limited to geographic boundaries. Berkun even describes a scenario where many engineers find it hard to leave after they become accustom to the benefits of being able to work from home or from a location that may not offer as many alternative employment opportunities. While there are many advantages to WordPress.com’s distributed model, they are also some pretty big drawbacks. In the book, Berkun describes that the lack of a holistic view can cause the end product to feel more like a bunch of individual features cobbled together rather than an integrated solution. Additionally, while this model may work well for developing individual, incremental features, it seemed to present challenges when architecting larger and more strategic projects that cross team boundaries. There also appeared to be limited upfront planning for testing and quality control, with teams preferring to fix problems after deploying. While this may work fine for a blogging service, you have to wonder how well this would work for more business critical applications. It is also likely to wreak havoc with non-SaaS products, where customers are forced to wait for and then install new releases to patch problems. As for the distributed, work from wherever you are model, Berkun details the challenges of working with teammates who you don’t get to see in person. It’s harder to bond. It’s more difficult to pick up non-verbal (or non-written) clues about whether they are happy, pleased, disappointed or frustrated. And it’s a pain to have to get up at 2AM to sign into a project meeting to work with others scattered across the globe. In fact, much of the book describes Berkun’s struggles to schedule times and places for team member to actually work together in the same room. If you’ve ever experienced these challenges, you probably know that it’s just easier to tap someone on the shoulder to ask a question or walk over to a whiteboard and talk through a problem. While I absolutely loved the book and appreciated Berkun’s detailed depiction of his experiences at WordPress.com, I was also left with some unanswered questions. Did the experiment of having a non-coding team leader work? The book describes Berkun’s efforts to lead a development team as a more traditional, non-engineering, program manager. Having someone in that role, who can focus on the strategic issues and see the forest rather than the trees would seem to be critical. However, the book didn’t explain whether the experiment was a considered to be a success or whether the company returned to a team structure where everyone codes. What happened to “Highlander”? Highlander was a project depicted in the book. It's objective was to unify blog commenting solutions. At the end of the book, it was described as only a modest success. Was the modest success related to the fact that the project crossed team boundaries, making it more difficult for a single, autonomous team to manage? Would this model work for a company that needs to market. WordPress.com has the fortunate position of being able to “draft” behind an extremely popular open source project. Because a lot of people use the free, open source product, many naturally try the WordPress.com solution. However, most companies don’t have that luxury and need to do demand generation (Advertising, SEM, Events, Marketing Automation, etc.) And if you need to do marketing, it’s more cost effective to have a centralized marketing function. Do you really want five separate branding campaigns and five separate marketing automation systems? So would a hybrid model, one with both a marketing department and autonomous teams, work as effectively or it would ruin the flexible, distributed development model that makes WordPress.com so successful? 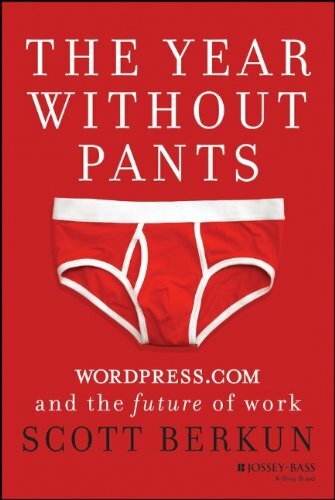 The Year Without Pants was a great read. I certainly recommend that you pick up a copy. And I would love to hear more from some of the other “Automatticians” about their experiences with WordPress.com’s distributed, team oriented software development model.